Well folks - the holiday season is well and truly upon us here. Now that Thanksgiving is over, I’m finding more and more homes decorated with wilder and wilder Christmas decorations. Every shop I walk into is playing Christmas music (yep, even the LYSs) and all I can think about is watching holiday movies while I knit myself into oblivion. I’m not 100% sure if it’s my favorite time of year but it’s definitely up there! 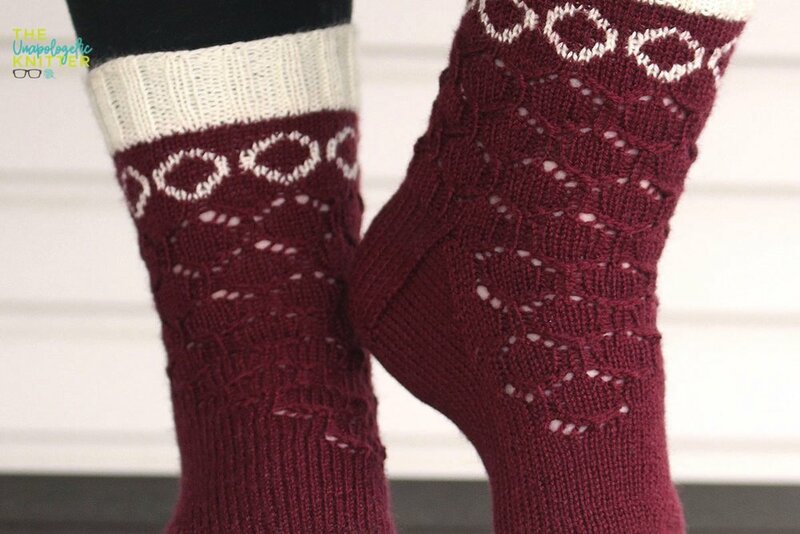 So, to celebrate the coming of another holiday season, I’ve partnered with Ewe Ewe Yarns and PostStitch to bring you a fabulous holiday sock pattern to keep your fingers working throughout the season! These socks take a page from the mosaic colorwork book. Each row of colorwork is only worked once (which modifies the standard 2-row pattern) and, my favorite part of mosaic colorwork: each rnd only uses 1 color so you’re not having to carry two colors around. And if these socks happen to make your “gotta make ‘em” list, now through this Sunday, December 9th at 11:59 pm PST, you can save $1 at checkout, no coupon code needed. No matter how you celebrate the holidays, I hope you’ll do one thing: MAKE! Make these socks. Make good food. Make time to celebrate your friends and family. Just make! Modified mosaic knitting and lacework to match put me in mind of the holiday wreaths that adorn so many doors during the holiday season. And the rippled toes mimic the mounds of snow on a winters eve... the quintessential holiday socks! 1 (2, 3): 7 (8, 9)” / 18 (20, 23) cm circumference at the widest part of the foot. 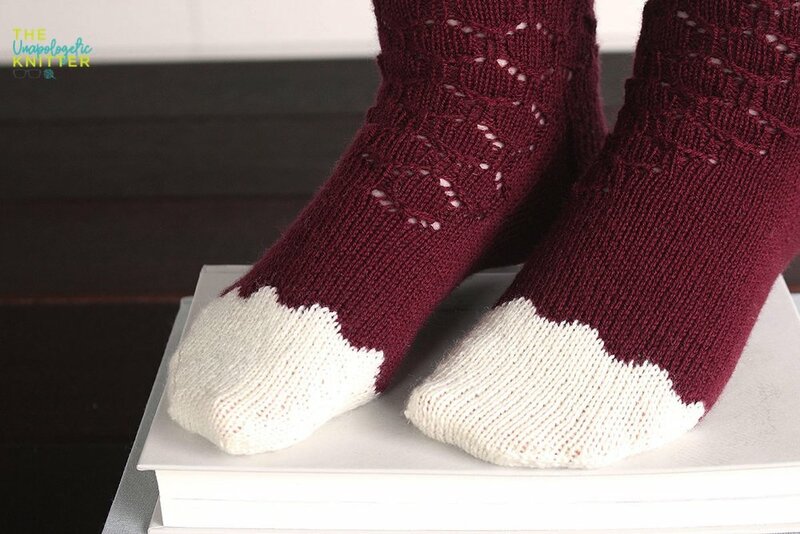 These socks are written for the Magic Loop technique and are worked from the cuff-down. These socks are mirrors of one another; please be sure to follow charts and written instructions for the Left and Right sock. In the Colorwork portions of the socks, carry the colors loosely up the inside of the sock to avoid multiple ends to weave in and to save on yardage. Thank you for taking the time to check out my latest design. I hope you’ll find some time to make a pair for yourself or a loved one during this holiday season. Happiest of holidays to you!